Bill Dibb, Abu Dhabi, UAE. The United Arab Emirates is a Gulf country with over 800km of coastline. During the last 4 years, I sailed in short weekend stages, single-handed, the whole coast. There was an opportunity to visit areas that are not accessible by land transport and to meet people who are not familiar with sailing boats. Some moments were humorous, others rather scary for me. The climate is pleasant except in the summer months when temperatures can get up to 50 degrees with excessive humidity. In the middle of the winter, it can get 'chilly', meaning that we have to put on warm jumpers for an evening BBQ or extended sailing! My Lugger has proved to be the best investment in 'living' that I have made. It is ideal for the shallow waters of the Gulf, with unpredictable sandbanks and uncharted waters. For the coastal sail, the Lugger has enabled me to visit areas out of bounds for smaller, more unstable boats and for larger, deeper vessels. There have been several times during the coastal trip that I had to drag my boat over quite large distances of extremely shallow water in order to find a channel that appeared to have 'moved' from its position on the charts. 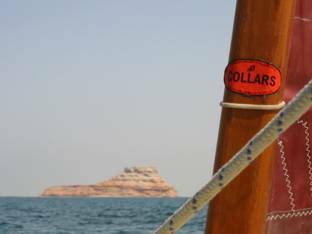 The Lugger provided immense enjoyment at weekends for sailing in Abu Dhabi for a Friday (the day off here) and perhaps some fishing, BBQ and swimming. However, the limited range of the Drascombe meant that after some time this became a little monotonous. It was then, in 1999 that I decided to sail the coast. The UAE is at the mouth of the Arabian (Persian) Gulf. A small part of Oman (the Musandam peninsula) divides the Gulf coast and Indian Ocean (Eastern) coast of the UAE. The major cities are Abu Dhabi (capital, my home town) and Dubai (commercial and tourist centre). Various other towns are dotted along the coastline. 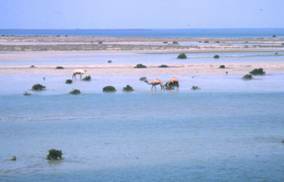 The 'forgotten' coast, west of Abu Dhabi to the border with Saudi Arabia is remote, poorly charted, and full of sandy islands, shallows and mangroves. For my sailing, I relied on Admiralty charts which were often correct. However, in some areas, massive projects to reclaim, reshape and dredge the sandy coastline are in progress and usually this was not on the charts. The sailing conditions are generally warm with a north-easterly sea breeze during the day. However, waves can quickly rise in exposed areas. Occasionally, a strong northerly wind - the 'shamal' blows for hours or days. It is unpredictable and can rise suddenly. Abu Dhabi has rainfall on average 10 days per year but there is more in the Eastern part of the UAE. After deciding to sail the Coast, I had relatively little idea about how to do this. I have learned by experience and can now give the following advice for any similar project. Launch and retrieve the boat at pre-arranged places. Carry on from there on the next available weekend. 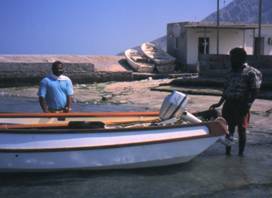 I often left the boat in the care of friendly and curious fishermen around the coast. Get land maps and charts for the areas you are intending to sail. Land maps are not as detailed as in the UK but do provide some information of value on where to launch your boat and retrieve it. Visit each area by car first with map and GPS to mark places to launch and retrieve your boat. In more remote areas, there may be large distances between each such place. Often, I had to drive on sand tracks for many miles to find a suitable place. Plan a clear route before starting the sail. Make sure your car (4-WD essential) AND trailer is in perfect condition. Take 2 spare tyres for the trailer and make sure that the workshop has not bolted them too tightly on to change yourself! As above, I will do this in list form. Many automatic procedures such as telling people where you are going are, I am sure, unnecessary to mention here. Make sure you have oars on board. I did not have to row too much but a single oar was used as a rudder many times in the frequent shallows. VHF radio is not the main method of communication here for coastal sailing. I had two mobile phones with me - one waterproof and one in a waterproof sac. There is generally a signal around the coast, although in the extreme West, I lost the signal for 3 hours in quite a remote area, out of sight of the coast, but close to massive shallows and did not feel happy during this time. If doing something similar again, I may invest in a Thuraya satellite phone. Take plenty of identification documents with you. The UAE is security conscious and I was stopped a few times by the police, enquiring who I was and what I was doing so near a palace! Each time, the problem was resolved amicably after documents were read and superiors contacted. Make sure you have a good GPS and chart with you. The most important point of all in the UAE: TAKE WATER !!! This is the main priority for any trip on land or water here. Several people have died from lack of water and it is surprising how much one drinks in hot weather in order to stay hydrated. I took a combination of commercial water bottles, water canisters and flexible water bags. Plenty of sun block (factor 30+). Have a clear idea of what you want to do. I wanted to get from launching place A to retrieval place B on each trip. I preferred to sail but had to use my motor (5hp Honda 4-stroke) as a backup. I chose a route that allowed me to hug the coast as far as possible but the shallows often extended out for several miles. Always start really early in the morning to allow yourself plenty of time to retrieve the boat and to make the most of the cool hours before midday. It is amazing where one can launch a boat and retrieve it. I was timid about this when I started but ended up finding several suitable places along each sector. Generally, common sense was used for safe sailing. However, it is important to understand that the priorities for safety are different to sailing in the UK. Ample DRINKING WATER is the number one priority. After many, many weekends, over the course of about 4 years, I completed the coastal sail. The scenery varied; from long stretches of desolate sandy plains and shallows with mangroves (west of Abu Dhabi to the Saudi Arabian border), to a coastline speckled with five star hotels (Dubai), to small fishing villages with wooden dhows and curious fishermen (North of Sharjah to Musandam) and mountainous areas with rocky coves (East Coast). The friendly reception everywhere. People were surprised that I could always get back to my car on arriving at my destination in the Lugger. There was always somebody around in a pickup truck that would kindly drive me back. 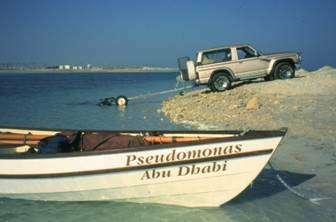 Also, it was never a problem to leave Pseudomonas safely for a week or two with a fisherman. Many people were interested, having never seen a sailing vessel in their waters before. Often, one could expect a crowd of curious onlookers - however, most wondered why I had decided to sail the coastline and could not understand it! Many were also surprised at my small outboard - petrol is cheap here and engines tend to be (too) large. I was pulled up by the curious coastguard / police a number of times but the problem was quickly resolved. Sailing through mangroves and shallows; particularly to the West of Abu Dhabi, there are many areas of sandy shallows with beautiful light blue water. Tide is only a metre or two and it is usually possible to gauge where you can safely sail without being stranded. 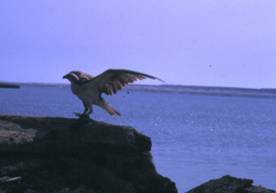 There is a variety of bird life to see - cormorants, ospreys and other species. Note camels in this photo! Some of the passages were along straight monotonous coastline. However, there was always life in the sea - turtles, dolphins and the occasional timid dugong (sea cow). Away from the cities, the sea is almost empty of boats and the fishing is very good. 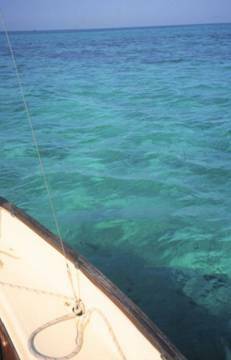 I caught several hammour (grouper), kingfish and barracuda by trolling a lure whilst sailing. The cities presented a great contrast to the desolate sections. In particular, the compacted skyscrapers of Abu Dhabi and the lines of hotels in Dubai. 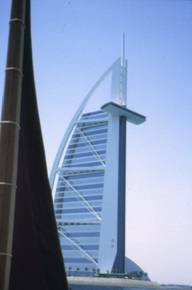 Sailing past Burj Al Arab (the worlds only 7 star hotel!) was dramatic and contrasted with the traditional dhow sailing race that was going on at the same time. It was rather worrying to see how urbanization is spreading along the coastline into areas of natural beauty. Let us hope that this development is done in an ecologically friendly manner. This was the most isolated area of the UAE. In some parts, great uncharted sandy shallows with coral patches stretch out for miles. The tide is only a metre or so. I was not particularly happy sailing for many hours out of sight of coastline, particularly when the mobile phone signal became weak and then disappeared. After about 4 hours of remote sailing just outside the shallows, it was a relief to see the small island of Az Zabbut in the distance and then the gradual appearance of the flat, desolate coastline. 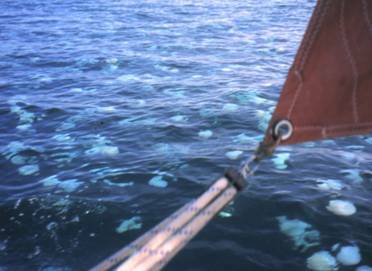 A sea of jellyfish near the Saudi Arabian border. I decided not to swim! This project has taught me how ideal a Drascombe is for Arabian waters. It has enabled me to visit areas that are completely inaccessible by road and where sailing vessels have possibly never been before. The Drascombe Lugger is an ideal boat for those who wish to explore remote, shallow coastal areas.